Country Cards by Rose: Tutorial Tuesday: We Must Celebrate! Welcome to another Tutorial Tuesday! 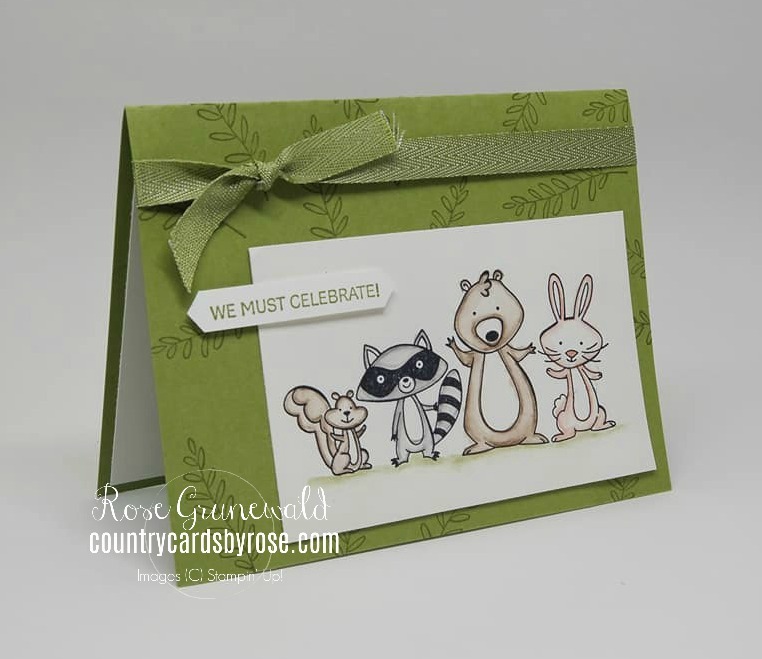 Today I'm featuring a card I made on my Facebook Live featuring the We Must Celebrate stamp set! Ok - so because of my busy schedule, I setup these Tutorial Tuesday blog posts ahead of time. I hope that this stamp set is still available by the time my post goes live! It's my very favorite stamp set from the Occasions Catalog, and it's retiring! · Stamp fern all over Old Olive card base using Old Olive ink. · Stamp animal friends on Shimmery White cardstock using Basic Black ink. · Use watercolor pencils to outline the inside of each animal in color of your choice. Use Aqua Painter to lightly blend outlined color toward the center of each animal. · Using SNAIL, adhere animal friends layer to card base. · Wrap Old Olive ribbon around card base and tie in knot as shown above. · Stamp sentiment on Whisper White scrap. Punch with Classic Label Punch & adhere to card using Dimensionals. You can get a more printer-friendly version of this tutorial HERE.